The coolest new lipgloss around? ModelCo Lip Lights Ultra Shine Lip Gloss. The tube holding this gloss is one of the most revolutionary this beauty chick has seen. LED lights are concealed within the lid and automatically light up as soon as you unscrew the cap. Worried about getting the perfect pout in a darkened club? Can't quite see your lips in the restaurant bathroom? Why, that's what these lights are for! They ensure that you have perfect application every time. While the lights can be a bit bright and scary-looking at first, after a few tries you'll wish every gloss came equipped with these babies. And as if that's not enough, the tube even has a mirror along one side -- so if you aren't near a mirror or compact, you'll still have one by your side. This gloss comes in three gorgeous shades: Coral, Indian Summer and Sienna Sunset. My fave is Sienna Sunset, which is the perfect shade of brownish peach that seems to look good on every skin tone. I love the subtle hint of shimmer within the gloss as well, making my lips seem to glisten and gleam with the best of them. Plus, the gloss is super-moisturizing and not at all sticky or tacky. Get ready to light 'em up. 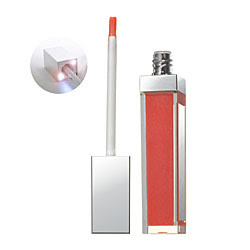 ModelCo Lip Lights Ultra Shine Lip Gloss retails for $19 at modelcocosmetics.com.